It's not an insult to say jazz guitarist Grant Green favored feel over technique. He didn't play double-time phrases or blaze with extended chords, instead favoring a languid, minimalist style that feels more like a blues singer's phrasing transferred to the fretboard. 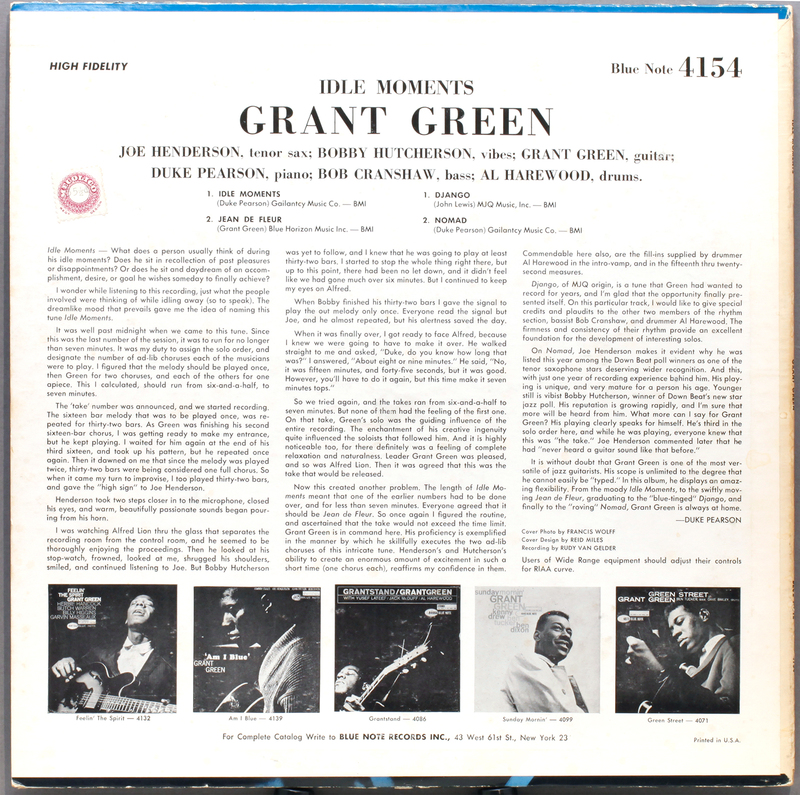 Green's single-line-focused playing was always lyrical, melodic, and funky, which is one of the reasons he was one of the most recorded musicians in the history of Blue Note Records. Alex Anest, leader of the Ann Arbor Guitar Trio, became so enamored with Green's playing that he decided to learn the guitarist's 1965 album Idle Moments in its entirety, which he'll present on Friday, October 12 at Kerrytown Concert House with Gayelynn McKinney (drums), Eric Nachtrab (bass), Janelle Reichman (tenor sax), Alexis Lombre (piano), and Peyton Miller (vibraphone). The recording is one of the most celebrated of Green's career, mostly because the title track is such a chill charmer. As told in the Idle Moments liner notes by pianist Duke Pearson, who also wrote the song, the tune's nearly 15-minute running time was the result of a happy accident: Green mistakenly played the 16-bar melody twice, setting up the longer solo structure for the rest of the musicians, all of whom followed suit. The rest of the album, which includes the songs "Jean De Fleur" (Green), "Django" (John Lewis), and "Nomad" (Pearson), is equally winsome and it's easy to digest why the record is so beloved. The CD reissue unearthed alternate versions of "Jean De Fleur" and "Django" (which is four minutes longer), and Anest based his arrangements for the concert on these takes. I spoke with Anest about what inspired him to cover the entire Idle Moments album and what he likes about Green's playing. Q: How did you decide on doing a Grant Green / Idle Moments concert? A: When I took a class from Benny Green at U-M, I was impressed by his encyclopedic knowledge of Blue Note records. One of the reasons that Benny is such a great player is that he really understands the music on a deep level. I was learning the song "Idle Moments" and realized that I only knew this one track from the album, so I decided to listen to the whole record while driving out to Cleveland for a gig. I immediately fell in love with the other three tunes and thought that I should learn them. The problem is that even if I did, it's not like I would ever have a chance to play them. No one is calling “Nomad” on the gig. At that point I realized that if I was going to play these tunes I would need to create the opportunity to perform them. That got me thinking that it might be a great chance to work with some really amazing musicians who I don't often get to perform with. I felt confident that I could find a venue where I could get paid enough to hire the best players around. That's when the idea of doing this performance came to me. Q: This is the second concert that I know of where you've dedicated a concert to a specific guitarist; the Emily Remler tribute at Old Town Tavern is the other one I know of from earlier this year. What inspired these kinds of concerts and is this sort of show harder to pull off because the band needs to learn a repertoire? A: The Idle Moments Project was already in the works when Ingrid Racine asked me to to the Emily Remler gig with her. It's not something I have done in the past. There are a few reasons why this type of show is appealing. First, it's an opportunity to honor our musical ancestors, and to keep some of the less-often-played repertoire alive. It's also easier to promote shows like this because the public has a point of reference. They may not know who I am, but they know if they like Grant Green or Emily Remler. Also, it's a great way to get people together to play. Everyone who I asked to do this project said yes right away. It's such an honor to work with people like Gayelynn McKinney, and I would never ask her to come out to Ann Arbor to play with me if I couldn't afford to pay her. As to the difficulty of pulling off a show like this, it is important to rehearse, but the most important thing is to just hire musicians who can play well. There was a fair amount of transcription work in getting the charts ready, but I did that in advance. The charts were done before I hired the band. Once we are up on the bandstand the goal is to have fun and be creative. Q: Are you keeping with the LP's arrangements, or did you switch them up some for the show? Are you playing the longer version of "Django" or the original LP version? A: I didn't change much in the arrangements, but I don't expect everyone to try to sound like the record. I just wanted the charts to relate to the record for ease of practice when we were learning the tunes. I based my arrangements off of the longer versions of "Django" and "Jean de Fleur." The album has no bass or drum solos so obviously we had to add some of those! Q: What do you enjoy about Green's playing? A: I got into Grant Green through his record Feelin' the Spirit. Grant's playing has such feel. It's not too showy and it's definitely not contrived. He and Joe Henderson, who plays tenor on “Idle Moments,” are very different players, but they both have a way of playing that I would describe as honest, and they are two of my favorite musicians. When I first heard Grant I had just finished my undergrad at BGSU, and I think that jazz was still a technical puzzle to me. I cared more about playing the right notes than about saying something. Grant would sometimes just play three notes over and over again with this attitude that said, “I will play this phrase until I'm ready to move on, and not a moment more or less.” He really took me out of my head and into my body, while still playing lines that were interesting. I love his tone as well. It's just so present. There are lots of guitarists with more chops than Grant, but none of them ever really reached down inside me like Grant did. The Idle Moments Project performs at 8 pm on October 12 at Kerrytown Concert House, 415 N. Fourth Ave., Ann Arbor. Visit kerrytownconcerthouse.com for tickets and more info. Read our interview with Anest regarding the Ann Arbor Guitar Trio's debut album, "Tides."